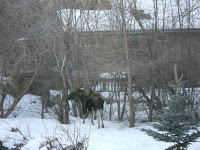 This moose visited our Anchorage Alaska bed and breakfast’s backyard winter garden. With more than 1600 moose living in Anchorage it is inevitable that you will see moose in the city. Camai B&B’s house has a backyard which borders Chester Creek where moose often browse especially during the winter months. Alaska wildlife within our city is abundant. Our bed and breakfast guests often ask when the next moose will stroll by. It is unfortunate that the moose do not have a published time-table for their visits to our neighborhood. The more frequent time for their appearance is either early morning just after dawn or late afternoon. 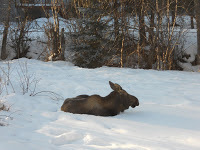 This moose came and rested in the yard in the late afternoon before continuing her browsing trip down Chester Creek. She is a frequent visitor this winter making it important for all of us to be aware of our surroundings before using the Chester Creek Trail system.